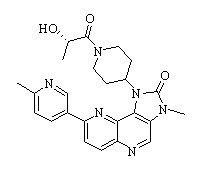 GNE-317 is a PI3K/mTOR inhibitor, is able to cross the blood-brain barrier (BBB). PQR-530 is a potent, oral and brain-penetrant dual pan-PI3K/mTORC1/2 inhibitor, exhibiting antitumor activity. LY 303511 hydrochloride is a structural analogue of LY294002. LY303511 does not inhibit PI3K. 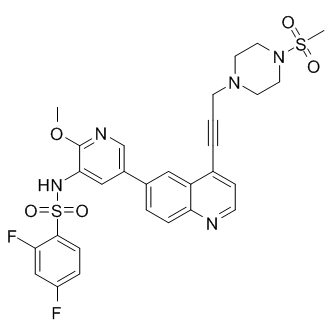 NSC781406 is a highly potent PI3K and mTOR inhibitor with an IC50 of 2 nM for PI3Kα. PKI-402 is a selective, reversible, ATP-competitive, equipotent class I phosphatidylinositol 3-kinases (PI3K) inhibitor with IC50 of 1, 7, 16 and 14 nM for PI3Kα, PI3Kβ, PI3Kγ and PI3Kδ, respectively. 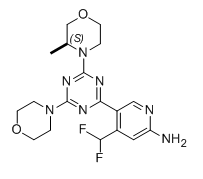 PF-04979064 is a potent and selective PI3K/mTOR dual kinase inhibitor with Kis of 0.13 nM and 1.42 nM for PI3Kα and mTOR, respectively.